The second part of the book starts with an excellent overview of formal comics theory, mostly relying on two works to illustrate various theorists' ideas. Having read many of the works Miller cites, I had something of an advantage in understanding these tricky, sometimes conflicting ideas, but because of her explanations and use of illustrating works, this chapter would be accessible to anyone confronting them for the first time. I certainly had no previous exposure to narrative theory or postmodernism, the topics of the following chapters, and I came away confident that I understood the basic frameworks that the author intended to explain. Part three explores national identity, postcolonial identities, and social class and masculinity; and part four looks at various perspectives related to psychology, psychoanalysis, gender identity, and so on. As with part two, each topic is paired with at least one work of comics that effectively illustrates the variety of associated ideas. For example, the chapter called "Psychoanalytic Approaches to Tintin" presents four authors' deep readings of Tintin albums: Benoît Peeters' reading of The Castafiore Emerald as castration anxiety allegory; Serge Tisseron's claim that The Secret of the Unicorn is a semi-conscious expression of Hergé's own ambiguous (possibly royal) lineage; Michel David's Lacanian evaluation of Captain Haddock as being saved from psychosis by a reunion with his ancestry (maternal mirror-self) and by recounting the story to Tintin (paternal signification); and Tom McCarthy's observation that signifiers of buried trauma recur throughout the series, and that Haddock is particularly threatened by Madame Castafiore as an expression of that trauma. At times it can feel like a bit much, and Miller speaks up when she finds certain ideas to be more or less compelling, but chapters where she is applying critical theory (rather than recounting others' ideas) are definitely the most engaging. Reading Bande Dessinée is an excellent survey of the ways critical theory can be applied to comics, French-language or otherwise, and I found it particularly helpful to have such a wide range of ideas filtered through a single scholarly voice. 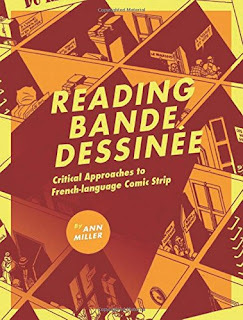 For this reason, I think it makes a great introduction for librarians who want to dip their toes into comics scholarship, even without previous exposure to the French-language comics being examined. (My one complaint is the same as with many works by academic presses -- too few reproductions of cited works, and too many works covered that are hard to obtain -- but Google image search goes a long way to make up for it.) At the same time, focusing on French-language comics helps English-language readers shake up their assumptions about this art form as a whole, and it opens some very interesting, and very culturally-specific doors about the ways culture as a whole affects the form and content of comics. Thanks to author Nick Sousanis for suggesting this title!